Marion Déprez is an experienced teacher and became a French language coach for the film industry in 2017. A Graduate in French from the university of La Sorbonne, Paris IV, she worked for over 10 years teaching French as a foreign language specialising in pronunciation. Déprez’s work for films comprises of coaching actors in acting in French. She also translates lines in realistic conversational French ( or historically accurate) and provides alternative versions with suitable phonetics to specific actors. Marion creates resources for voice department to coach actors with their French accent in English. She teaches English to, interprets for and assists French actors on British shoots. Marion Déprez moved to the UK in 2005 to complete a Master I and a diploma from La Sorbonne in French as a foreign language. 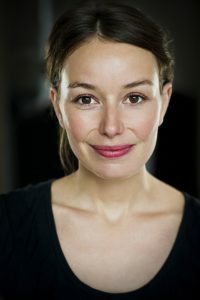 She then trained in London as a performer and director in Jacques Lecoq School of Physical Theatre and started a career as an actress/ director and a French teacher. Marion is passionate about education and finding new ways of teaching. She has designed a pronunciation course for Sussex University and is developing an online French pronunciation course. She is currently working with Suranne Jones for Gentleman Jack.